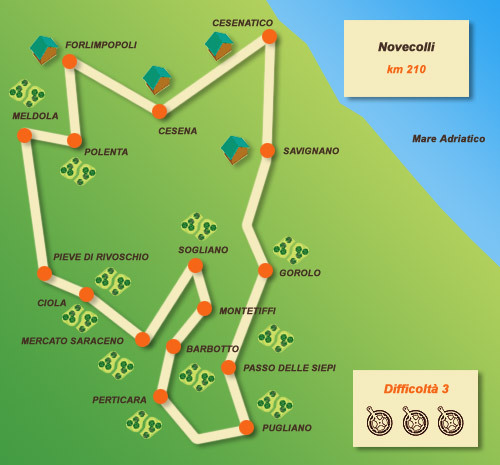 The most complex and famous route of the Cesenatico inland area: 205 km and 9 uphill stretches. Truly complex, but with two variants, an easier one for beginners and a tougher one for the more athletic. 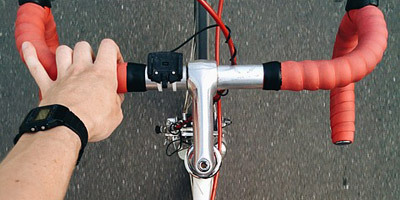 The ride starts from Cesenatico and goes to Forlimpopoli, where the route takes an uphill turn as far as Bertinoro. The slope gets particularly tough in the stretch towards Polenta, with climb gradients up to 15%. You carry on in the direction of Mercato Saraceno and the third hill on the route, the Ciola. True athletes’ legs are really put to the test in the area around the Barbotto, 6 km uphill that culminate in a stretch with an 18% slope. You get to the sixth hill, Montetiffi, with yet more tough stretches to overcome, then on to the seventh hill, Pugliano, 787 metres above sea level, the highest point on the entire route. You then head on to the eighth hill, the Passo Siepi, then on to the ninth, the Gorolo, with 13 to 17% gradient stretches. In our Hotel you can find many other routes, with elevation charts and specific technical guides, which we are happy to provide to our cycling guests.